While it still is something of a niche foodstuff in North America, carob is a familiar feature of its native Middle East and the Mediterranean, where people frequently plant carob trees along avenues to provide shade. Each tree yields fleshy pods with a variety of culinary uses. 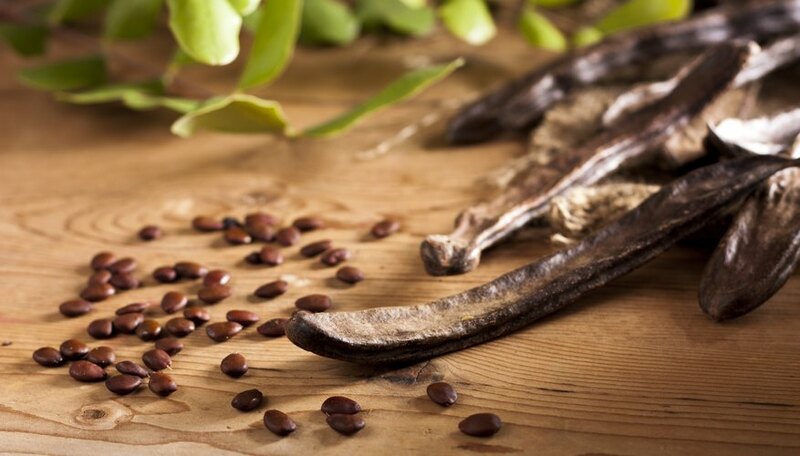 Carob has been cultivated for more than 5,000 years and long has been a significant legume in Jewish culture. The tree is mentioned in the New Testament and some authors suggest it was on carob pods, not locusts, that John the Baptist survived in the wilderness. Consequently, the carob is referred to as St. John’s Bread. Because carob seeds have a relatively uniform weight, they were used in the weighing of gold, from which the Arabic word "carat" originates. Having spread to South America and Asia, carob seeds were introduced to the United States in 1856. Although native to the Levant and surrounding area, carob since has been cultivated in the warmer regions of the United States, particularly the southwest, Florida and southern California, where it can endure harsh, arid conditions. The tree bears glossy, reddish-brown to dark-brown pods that grow up to a foot long. When the pods are dry, the hard seeds inside rattle, but once the ripe pod is wet, the high sugar content within quickly causes fermentation. Carob is a versatile legume. The raw pods are used as a nourishing cattle feed in the Middle East, but for culinary purposes, the most common use is as a ground powder substituted for chocolate. In the Middle East, the raw pods are chewed for their sweet pulp -- but the seeds are not, as they are hard. Roasting the pods readies carob for grinding into a fine powder or flour. Naturally sweet, the flour is a replacement for chocolate or cocoa in cakes, cookies and breads. In recipes that call for cocoa, carob is a straight substitute in terms of measurements, but allows cooks to cut back on the total amount of sugar required and carob contains significantly less fat. Unlike chocolate, carob powder does not contain caffeine, making it a viable ingredient for stimulant-free diets such as Ital. Carob seeds are ground to make a gum used as a stabilizer in ice cream, salad dressings, canned meats and jellies, among others. Carob may be hard to find in supermarkets, but it usually is sold in health food stores, where it is available year-round. Although it is most commonly sold in powder form, carob also comes as chips almost indistinguishable from chocolate chips, molasses or syrup. The powder can be sold from raw or roasted pods, with a subtler flavor than chocolate and nutty, smoky undertones. Carob syrup is a natural sweetener for cakes, cereals and beverages or may be drizzled on pancakes. Its low glycemic index compared to other syrups makes it a suitable alternative for diabetics. What Tree Has a Long Black Bean Pod? What Plants Grow in the Kalahari Desert?